On an extremely early Saturday morning, a bunch of us loaded a bus to venture off to Jetwing Kaduruketha in Wellawaya. A 4 hour drive from Colombo, we travelled through the early hours of the morning with a few stops along the way for breakfast and shots of the most scenic landscape. When we reached Wellawaya, we drove away from the town into a more quieter part of the area and squeezed our way through the narrow road that leads to the hotel. 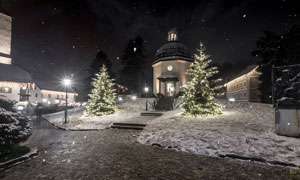 The first thing we noticed about the hotel wasn’t its stunning location or architecture but rather the resonating silence that washed over us as we stepped out from our bus. Nestled in a rural landscape, the hotel is isolated in the middle of nowhere; away from the busy roads and the chatter of people. Aside from a few callings of the peacocks passing the property, the absolute stillness of the hotel gave us a great first impression as quietness is a rare luxury in Colombo! As scenic as the journey was, it was also tiring and after a warm welcome by the staff at Jetwing we were ushered straight for lunch. 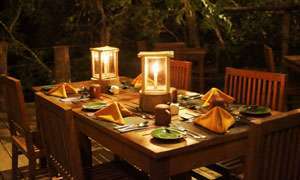 The restaurant at Jetwing Kaduruketha is an intimate space that can accommodate around 60 guests at a time. Overlooking their infinity pool and the paddy fields, it’s built at a vantage point to give diners a picturesque background as they dig into their food. Their restaurant serves a la carte and while they do have an Asian fusion menu; the hotel is known and praised for their local cuisine. In keeping with the locality, they offer ulundu wade and kadalaparippu wade with a spicy lunumiris instead of a bread basket. Hot and crispy, straight from the frying pan, this bread basket was enthusiastically received by all of us at the table. For lunch we ordered their farmers steamed rice and curry which you can order in chicken, fish, pork or beef. The rice and curry dish comes with a whole range of curries with a green sambol, a pol sambol, boiled eggs and papadam. The flavours of the rice and curry were phenomenal and is a recommended dish for lunch! After lunch we headed to our rooms to freshen up before our activities began. Spreading across 60 acres of land, the hotel property is massive and is surrounded by forests, mountain terrace and paddy fields. 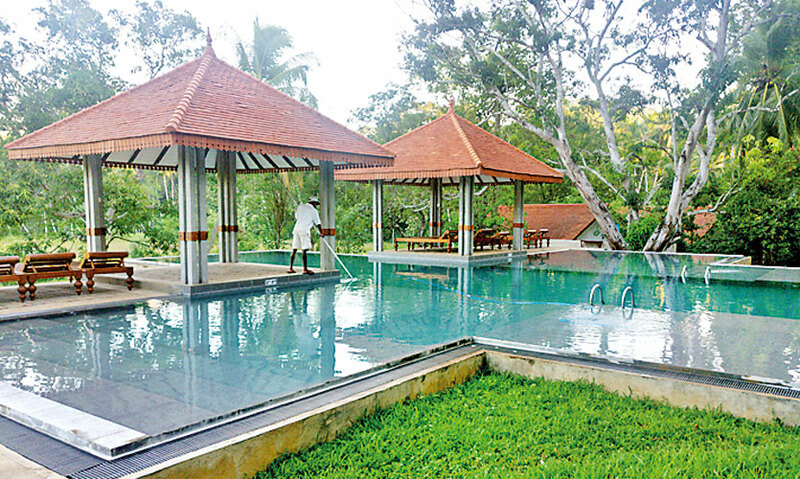 Jetwing Kaduruketha is one of Sri Lanka’s first agro eco-luxury resort with 25 dwellings spaced out across the property allowing each dwelling to be surrounded by forests and paddy fields. There are two types of dwellings; Wel Vidana and Arachchi. Each dwelling is made with bamboo and wood and optimizes the natural ventilation offered in the property. The rooms don’t have AC and it doesn’t need to because there is plenty of fresh air to keep you cool. The room is sparsely decorated with a heavy inclination towards open spaces and the colour scheme blends seamlessly with the nature aspect of the hotel. The dwellings have a back porch that opens up to the paddy fields and provides a space to just sit down, relax and take in the stunning views of the property. After freshening up we put on our hiking shoes to do a little exploring of Wellawaya. We first made our way to the Ella Wala falls. A few minutes away from the hotel, there is a small trek to the waterfall which is a little tricky but fear not, we met two helpful guide dogs who escorted us to and from the falls, so you won’t get lost! 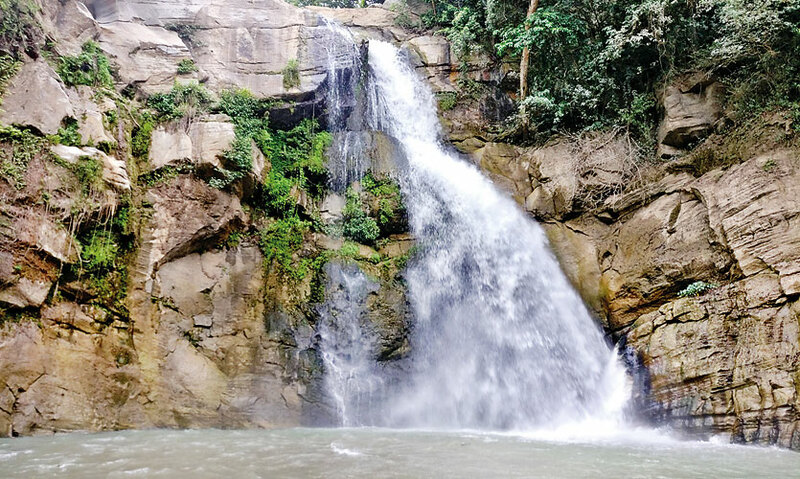 The Ella Wala is a hidden waterfall surrounded by mountains and is a famous spot for locals to come take a dip. The waterfall itself is absolutely stunning as it cascades down from a height of about 4 meters into a pool of teal blue water. 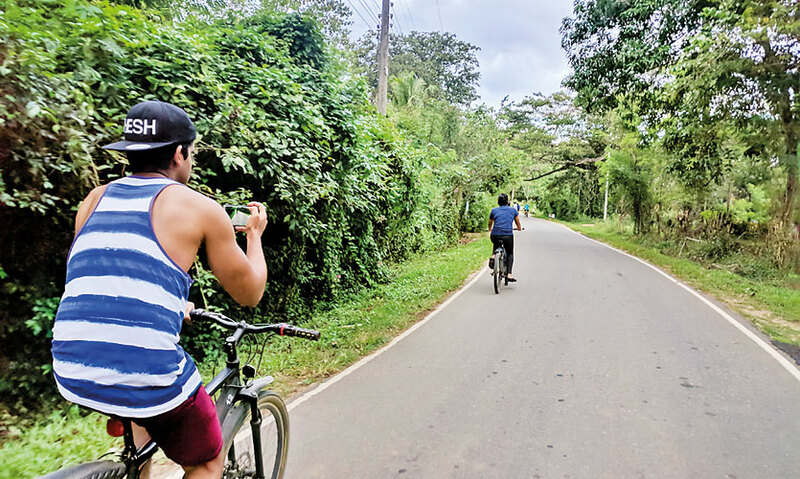 After a small dip in the cool waters, we proceeded back to the hotel, mounted the bicycles offered at each dwelling and cycled our way through a village to explore more of this beautiful area. Exhausted but utterly exhilarated at the same time, dinner was a casual affair back at the hotel. Going local once more, we opted to have a typical Sri Lankan meal with roast paan, pol sambola, dhal curry and chicken curry. We started our second day a little early at 5.30am to trek our way to Diyaluma Falls for breakfast with a view. Waking up at Jetwing Kaduruketha is a surreal experience. You wake up to a view, with dawn just breaking into the sky and the call of peacocks as your only sound. With a warm mug of coffee in our hands, we ventured to the back patio and sat for a while just enjoying silence washing over us and feasting our eyes on the scenic mountains and paddy fields with the half-moon still visible in the sky. From the bottom of the hill there is a tricky trek off the beaten path where you have to tackle loose rocks and bushy trees and even leeches if the ground is wet! For an hour we trekked our way up the hill until we heard the sound of rushing waters and in no time we found ourselves surrounded by blue waters gathering and gushing down a height of 220 meters. 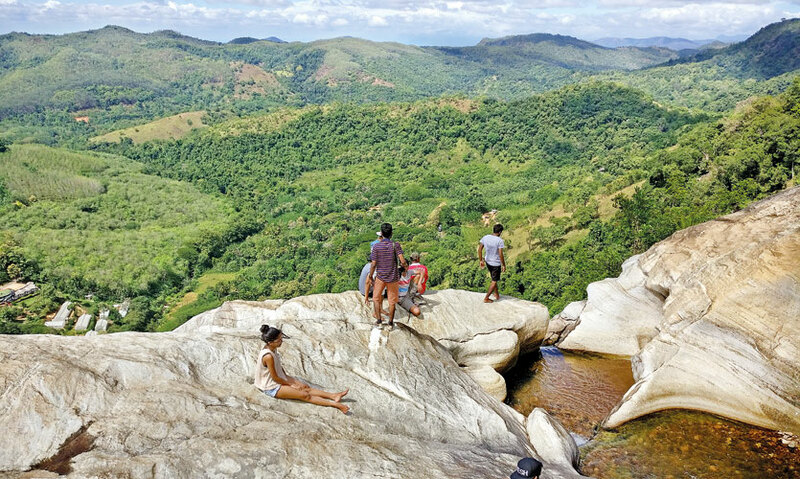 Diyaluma falls is the second highest waterfall in Sri Lanka and is an absolute vision to witness up close. The water is crystal clear and freezing and sitting on the ledge of the rocks near the waterfall, we were treated to a magnificent vision of mountains and plush greens surrounding the area. Perched on a rock, we happily feasted on the breakfast arranged for us by Jetwing; chicken club sandwiches with fruits and a juice to quench our thirst. 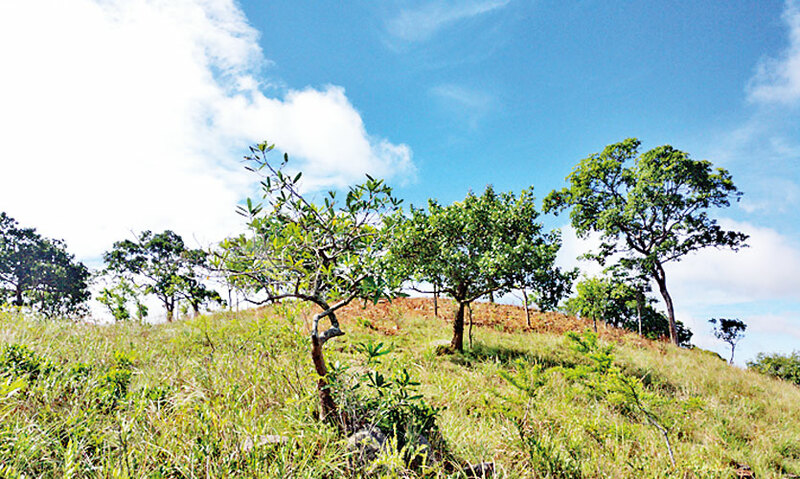 The Assistant Manager of Jetwing Kaduruketha, Hasantha Lokugamage, also climbed the mountain with us and as an avid trekker and environmentalist, his knowledge on every plant, animal and place in the area provided us with a great insight into Wellawaya and its little wonders. 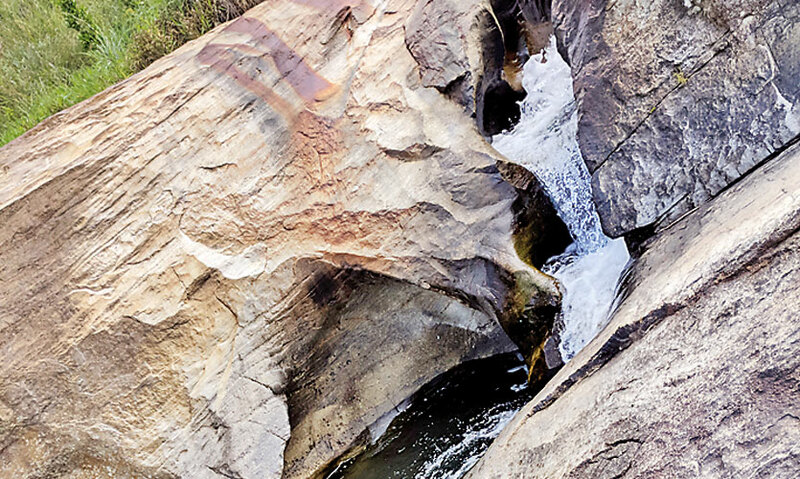 The waterfall has many natural pools to take a dip in and with its crystal clear cold waters, you wouldn’t want to miss out on the opportunity to splash around! As the highest elevation of the waterfall is a camping site, Jetwing is more than happy to arrange an overnight stay at this location! Returning to the hotel we had an amazing lunch with the kitchen having prepared us their take on lamprais. Wrapped in banana leaf, the lamprais was steaming hot with yellow rice, spicy chicken and batumoju and eggs. Like all the food we’ve tasted at Jetwing, the lamprais was excellently prepared and packed with flavour. After lunch we took a little tour of the hotel. 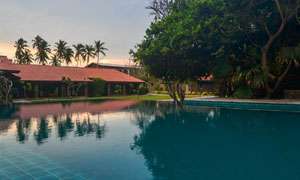 As an eco-luxury resort, Jetwing is built around the locality of Wellawaya and situated in the foothills of the Poonagala mountain range, the hotel is surrounded by nature. Their infinity pool boasts a fantastic view of the paddy fields and the mountains and one can even just take a walk around the hotel grounds and get lost in all its greenery. The hotel also has its own Ayurvedic Spa that uses herbal oils to heal, relax, detoxify and rejuvenate. For us it was an eventful weekend. Exploring the hidden treasures of Wellawaya, having breakfast 628 ft above sea level, tasting the wonderful local cuisine at Jetwing and just being surrounded by nature for a full 48 hours away from the noises of the city; Jetwing Kaduruketha struck the perfect balance of relaxation and excitement for us!